Leezy Lindsey: Shame on Milton Bradley! I have had lots of fun introducing my girls to things I loved as a kid. I've put glow-in-dark stars on Sadie's ceiling, forced her to love Ariel, and have rocked out to the Best of Wee Sing while driving around town. Another one of the things I was excited to buy for the family was Hungry Hungry Hippos. It took 20 minutes to put together and less than a minute to figure out I had wasted $17.49. The first disappointment is that you have to snap the hippos onto the board and take them off to fit the game back into the box. Second is that there aren't very many white marbles. 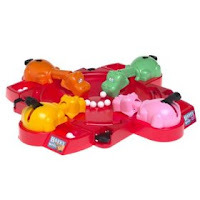 The third and biggest downfall is that the hippos jam when you hit them. I barely had to push on my pink hippo before it would get stuck. It was frustrating because isn't the point of the game to be able to smash those hippos as fast as you can? I mean, that's how you win the game! If your hippo stops in the middle of the competition, where's the fun in that? This cheap version of the game is no where near as fun as the one I had when I was a kid. What a shame. I AGREE!!! Games now have really become CHEAP!! You might be able to go to Good Will and find an older set. I found the old Sorry! for like $1 there. All pieces were in the game too, but I am sure Hungry Hungry Hippos is tougher to find. That is a REAL CLASSIC! it is from 1978, so it has to be made like a tank! ok, so that link didn't exactly work, but go to ebay and do a search for hungry hippos and about halfway down the first page is the one from 1978, with box and all! Thanks Patti! I checked eBay about a week ago and only saw the new version. I'm going to have to get this one. Vintage comes at a price though...$12.95 for shipping alone! :) It's worth it! Thanks again for your help! The same goes for appliances. The just don't make things the same anymore. Three words... Made in China (who knows if the older games were made there too)! You're a great mom to play preschool games with your kids. I need to be more willing! Oh, I agree! Mom bought this game for the girlies, and it was SO frustrating! Maybe you should write a formal letter of complaint, post it on your blog, and have all of your blog readers digitally sign it. That might make a difference? WE had the same problem. we bought it- yes for jason and I - but we played it with our friends lil girl and it was always jamming- no fun!